This week, during Dine Out For No Kid Hungry, we have an opportunity to truly be the change – an opportunity to use our collective “Klout,” “Kred,” Reach, and Influence to give a voice to the 16.1 million children in America who are hungry. It’s a big goal, and not only are we going to do it – we’re going to have some fun along the way. 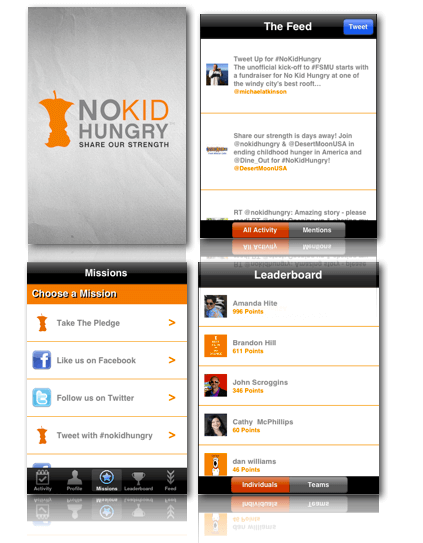 Just in time for the Dine Out, we’re rolling out the official Team No Kid Hungry iPhone App (can only download from your iPhone)! If you’re not reading this from an iPhone, here is the web versionhttp://www.teamnokidhungry.org. This app will not only help us reach our goal and continue to grow the movement, it will keep us connected throughout the year and keep us united on focused actions to end childhood hunger. The app will be the perfect place to join our annual “TwEAT Out” for the Dine Out For No Kid Hungry on Monday, September 17th, to earn points, badges, and even rewards for completing “missions” the week of the Dine Out (Sunday, September 16th – Saturday, September 23rd), and stay connected year-round to stay on top of the leaderboard as one of our top Hunger Heroes. Not an iPhone user? Don’t worry, you can still join in the fun by visiting http://www.teamnokidhungry.orgfrom any mobile device with an internet connection. We can’t wait to see all of you become Hunger Heroes! Download the app now! http://www.teamnokidhungry.org/app. App must be downloaded directly from your mobile device.